Is Windows 8 really killing the PC market? The Surface tablet may not be crushing the competition with the vigor that Microsoft undoubtedly hoped it would. However, as compared to its third-party Windows tablet brethren, Surface is absolutely killing it—though Windows tablets still have a long road to travel before they're considered anything close to a success. Between the Surface Pro and the Surface RT, Microsoft hardware comprised half of all Live Tile-sporting slates sold in the first quarter, according to a recent IDC report. Microsoft moved 900,000 Surface tablets in total last quarter, with the business-friendly Surface Pro being a big chunk of those shipments. That may seem paltry when you consider that Apple and Samsung respectively moved 19.5 million and 8.8 million tablets in the same time frame, but according to IDC, those 900,000 Surface slates made Microsoft a top five tablet vendor mere months after entering the hardware arena, supplanting Barnes & Noble. 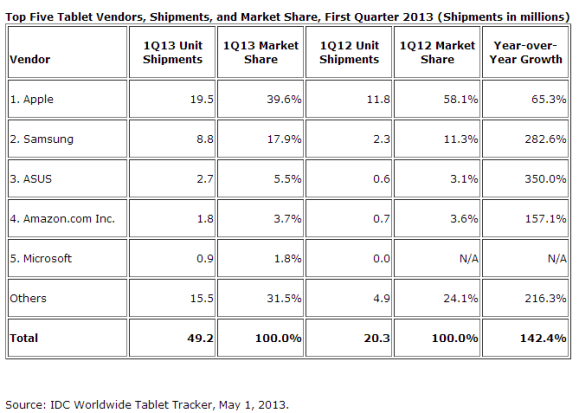 Not too shabby—though it probably says more about the state of the overall tablet market. Speaking of which, overall Windows tablet sales are a mixed bag. The IDC report claims that Windows tablets as a whole moved only 1.8 million units, with only a dreadful 200,000 of those dreadful Windows RT slates shipped all quarter. (Disaster for Windows RT looms ever closer.) A recent Strategy Analytics report, however, claimed that Windows tablets account for 7.4 percent of all first quarter tablet shipments, moving 3 million units in total. The truth probably lies somewhere between the two analyst estimates. Still, no matter how you count it, Windows tablets are struggling for relevance with consumers. That reality is made all the more brutal given the woes Windows 8 has faced in the slumping PC market after being overhauled with a tablet-first interface. Despite these early troubles, Microsoft is making moves to shore up its position. First and foremost, an impending update known as Windows Blue (or Windows 8.1) is adding a multitude of finger-friendly features that arguably should have been in Windows 8 from the get-go. New gestures, more useful PC settings options, and a modern version of SkyDrive that actually syncs files will add a lot to the base Windows tablet experience. Next, most of the tablet market has moved on to smaller 7-inch form factors, and Windows 8 as we know it wasn't built for diminutive displays. Thanks to its new focus on rapid iteration, Microsoft has been able to roll out a number of tweaks paving the way for smaller slates, such as support for lower screen resolutions and improved Snap functionality. Microsoft is also said to be offering Windows and Office licenses to manufacturers at a dramatically reduced cost to spur development of small-screen Windows 8 hybrids and tablets. 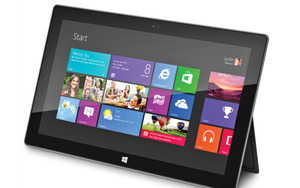 Expect the Surface series to embrace smaller screens as well. Rumors about pint-sized Surface slates have abounded for months, most recently in a Thursday DigiTimes report claiming that Microsoft is sourcing parts for second-gen Surface entries sporting 7- and 9-inch screens. Finally, the power-sipping promise of Intel's impending Haswell processors could help hybrid-style slates like the Surface finally achieve Ultrabook-like power in a tablet form factor, but without any of the limitations found in first-generation experiments like the Surface Pro or Razer Edge. Even with those improvements, only time will tell if there's a brighter future for Windows tablets. Smaller slates may be what the people are clamoring for, but Windows tablets still pack higher price tags and a more schizophrenic interface than the iOS and Android competition. Thanks to that, a 7-inch Surface slate may be D.O.A. if it doesn't pack a killer app—like, say, deep-rooted Xbox integration. If Microsoft can make that happen, the Surface brand just shine even more brightly in quarters to come.